Dry ice productionDry ice production with our "White Lion Antarctica 130"
Automated dry ice blastingThe automated technology of "Robby 5000"
Working in close cooperation with KAESER, White Lion offers you the optimum compressed air supply that you need for the portable and stationary application of dry ice blasting technology. KAESER is a manufacturer for the supply of production and work processes with compressed air. Their solutions include compressed air generation, conditioning and distribution systems designed to achieve maximum overall cost-effectiveness. With innovative products and services and outstanding product quality, KAESER system solutions help compressed air users boost their competitiveness. In continuous dialogue with its customers, the company develops pioneering concepts to improve overall cost-effectiveness (life cycle costs) and to achieve the best possible availability of compressed air systems. KAESER is continuously expanding its position as a leading global provider of compressors and products that use compressed air technology with a successful international sales and service organisation. We are proud to offer our equipment in conjunction with the quality products manufactured by as prestigious a company as KAESER. Regardless of whether the application is stationary, for example for automated robot blasting with our WL 5000 Robby dry ice blasting system, or portable with our WL 3000 Profi or WL 5000 XL systems as traditionally required, you can be sure to achieve the best performance from our systems with the reliable flow of compressed air supplied by KAESER. Here is a selection of portable compressors we recommend for use with our dry ice blasting systems. We are pleased to offer other models and variants on request. 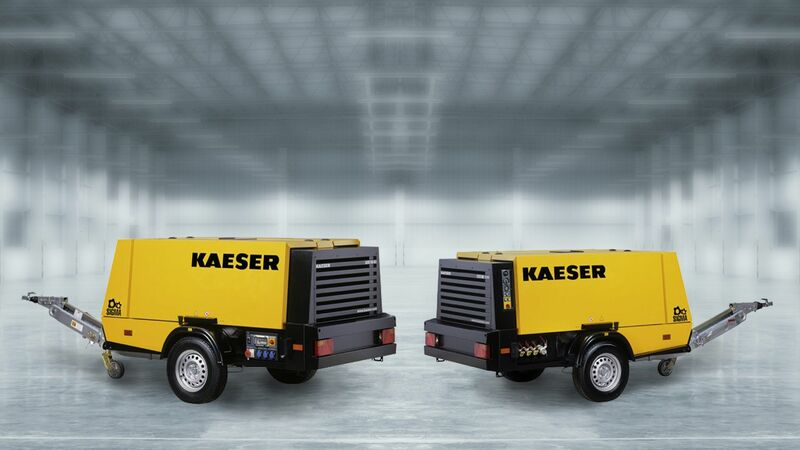 All systems and compressors can be leased or financed directly from KAESER or through our financing partners. Modern compressors for dry ice blasting are expected to supply compressed air as reliably, efficiently and quietly as possible, and also to provide additional benefits wherever possible. The new Mobilair 115 is a compressor in the 10-cubic-metre class that meets these user expectations in every respect. We highly recommend this compressor for the dry ice blasting units WL 1000 Minimax, WL 1500 Competition, WL 3000 Profi and WL 5000 XL Airmax. With 11,5 m³/min effective free air delivery at 7 bar and four compressed air outlets, the Mobilair 115 packs a serious punch and can be described without exaggeration as a portable compressed air “power station“for the site. In addition to this version, versions with 8,4, 9,7 and 10,5 bar maximum overpressure are also available. With the last version, the pressure can be continuously reduced to 5 bar using a handwheel. In dry ice blasting systems by White Lion, continuous air pressure regulation is integrated! At the heart of the system is an energy-efficient KAESER screw compressor block with a “SIGMA PROFILE”. It is powered by a water-cooled Kubota four-cylinder turbodiesel engine with 85 kW rated output. Despite its high performance, the compressor is easy on the ears of operators, local residents and passers-by: measurement of the sound pressure level produced by the machine (measuring surface sound pressure level in accordance with ISO 3744) yields a moderate value of 70 dB (A), with a guaranteed sound power level of <99 dB (A) as per 2000/14/EC. The machine is designed for ambient temperatures of -10 to +50 °C, and for special requirements in cold climates, a low temperature version for use from -25 °C is also available. A standard patented anti-frost system protects the compressed air tools from freezing in the transition period when outdoor temperatures are often low and helps to prevent corrosion damage. This increases the reliability and durability of White Lion dry ice blasting equipment considerably. Manual switching from pressure-free warm-up to load operation allows the compressor to be started gently even in cold weather. The fuel tank provides enough reserve power for more than eight hours of full load operation. And the versatility of the Mobilair 115 is also impressive: a range of optional treatment components can be used to generate the cooled, dried and oil-free compressed air required for example for concrete restoration in accordance with the German ZTV-SIB standard, and even to generate fresh air. Depending on operational requirements, you can also choose between a road version with an overrun brake and a fixed or adjustable towbar, a skid version or a version with machine feet. We are also happy to deliver the compressors in your company colours to match the vehicle fleet. It goes without saying the quality of workmanship and the ease of operation and maintenance meet the standards expected of a modern portable compressor: metallic body parts are durably protected against corrosion by zinc pretreatment and powder coating. All service points are easily accessible through large gull-wing doors, and operation is extremely simple thanks in no small part to a clearly laid out instrument panel. The M115 compressor meets our requirements for modern dry ice blasting equipment and provides the best conditions for a smooth working day with the WL 3000 Profi dry ice blasting system. Modern portable compressors are expected to supply compressed air as reliably, efficiently and quietly as possible, and also to provide additional benefits wherever possible. The new Mobilair 114 is a compressor in the 10-cubic-metre class that provides the ideal conditions for dry ice cleaning and meets your expectations in every respect. 9.7 m³/min effective free air delivery at 10 bar and four compressed air outlets: the Mobilair 114 packs a serious punch and can be described without exaggeration as a portable compressed air “power station“for dry ice blasting. In addition to this version, versions with 12 and 14 bar maximum overpressure are also available. With the last version, the pressure can be continuously reduced to 5 bar using a handwheel. Continuously variable pressure adjustment is also included in all White Lion dry ice blasting systems. At the heart of the system is an energy-efficient KAESER screw compressor block with a “SIGMA PROFILE”. It is powered by a water-cooled Kubota four-cylinder turbodiesel engine with 85 kW rated output. Despite its high performance, the compressor is easy on the ears of operators, local residents and passers-by: measurement of the sound pressure level produced by the machine (measuring surface sound pressure level in accordance with ISO 3744) yields a moderate value of 69 dB (A), with a guaranteed sound power level of <99 dB (A) as per 2000/14/EC. The machine is designed for ambient temperatures of -10 to +50 °C, and for special requirements in cold climates, a low temperature version for use from -25 °C is also available. A standard patented anti-frost system protects the compressed air tools from freezing in the transition period when outdoor temperatures are often low and helps to prevent corrosion damage. This increases the reliability of the dry ice cleaning process and the service life of the unit considerably. Manual switching from pressure-free warm-up to load operation allows the compressor to be started gently even in cold weather. The fuel tank provides enough reserve power for more than eight hours of full load operation. And the versatility of the Mobilair 114 is also impressive: a range of optional treatment components can be used to generate the cooled, dried and oil-free compressed air required for example for concrete restoration in accordance with the German ZTV-SIB standard, and even to generate fresh air. Depending on operational requirements, you can also choose between a road version with an overrun brake and a fixed or adjustable towbar, a skid version or a version with machine feet. It goes without saying the quality of workmanship and the ease of operation and maintenance meet the standards expected of a modern compressor: metallic body parts are durably protected against corrosion by zinc pretreatment and powder coating. All service points are easily accessible through large gull-wing doors, and operation is extremely simple thanks in no small part to a clearly laid out instrument panel. The M114 is an ideal solution for the operation of White Lion dry ice blasting systems.